Rents are skyrocketing in the borough thanks to inflexible zoning rules. Let's not bother trying to sugarcoat it: New York City is in the midst of a gentrification crisis. What started as a germ in Greenwich Village half a century ago has come to engulf most of the island of Manhattan, and is making significant inroads in Brooklyn and Queens. The city's elite have pushed the vanguard out of their trendy Manhattan neighborhoods, and those same artists, cool kids and gays are in turn now pushing the poor and middle class out of their outer borough neighborhoods. The city has experienced rapid urban displacement in the past, but the current crisis is different in one very important way: the housing that the poor are losing to the rich is not being replaced. Demand has spilled out of the neighborhood much faster than it would have if Williamsburg had been allowed to grow. According to data from the U.S. Census Bureau, the number of housing units in the five boroughs inched up an average of 0.5 percent annually between 2000 and 2010. That's not even enough to keep pace with average U.S. population growth, which is about 1 percent per year. And of course, prices skyrocketed over the same time period. The median sales price for Manhattan condominiums was $681,299 in 2000, but shot up to more than $1 million by 2010 [PDF], and that was after the housing bust. Nowhere is this gap between supply and demand more apparent than in the northern Brooklyn neighborhoods of Williamsburg, Greenpoint and Bushwick. These neighborhoods are more or less frozen in 1961, when the city's zoning code restricted density and required parking in new construction. The vast majority of Williamsburg is zoned for row home-sized buildings. The city's ubiquitous six-story tenement would be illegal to build in most of Williamsburg today, as would many of the neighborhood's coveted loft buildings. New construction sprinkled around the neighborhood stands out, but when you take into account the high ceilings, setbacks on upper floors and space that must be dedicated to parking according to the zoning code, the newest buildings almost never contain more living space than those built a century ago. In some neighborhoods, this sort of conservative zoning makes sense. The tree-lined blocks of Brooklyn Heights and Park Slope, for example, thick with brownstones and pre-war apartment houses, are urban treasures worth preserving. But northern Brooklyn is not brownstone Brooklyn. Functionally, the industrial zoning along the waterfront and throughout Bushwick is hopelessly out of date. Urban manufacturing here is a shell of its former self. Car repair shops, wholesalers, warehouses and storage facilities are now the main tenants of Brooklyn's "manfacturing core." More importantly, northern Brooklyn is underdeveloped. 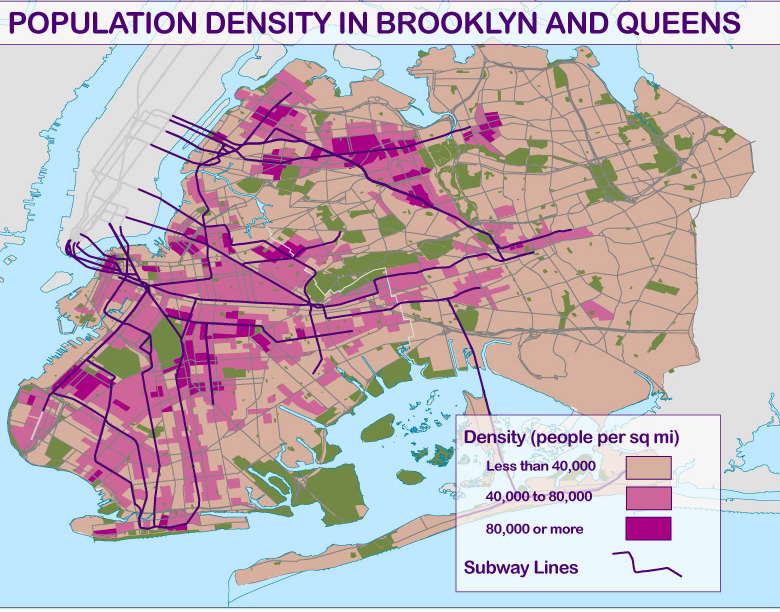 The hip neighborhoods around the L train, the main vehicle of gentrification in Williamsburg and Bushwick, are less than half as dense as Brooklyn neighborhoods like Crown Heights and Bed-Stuy. Because the amount of housing in the neighborhood is effectively capped through zoning, demand has spilled out of the neighborhood much faster than it would have if Williamsburg had been allowed to grow. The working class neighborhood of Greenpoint to the north was next to be gentrified. It is no longer a destination for the working class Poles, Hispanics and African-Americans who used to live there, and the only ones who remain are those who own their own homes, live in public housing projects or signed rent-stabilized leases back when the neighborhood was still affordable (and have been able to keep up with the rent since). Past Williamsburg on the L train comes "East Williamsburg," a real estate neologism for what was the industrial section of Bushwick. East Williamsburg actually has an abundance of underused land around Bushwick Creek, but Mayor Bloomberg and Brooklyn borough president Marty Markowitz don't want to allow any residential development in the neighborhood, in order "to preserve the city's manufacturing base." Zoned out of Williamsburg, Greenpoint and "East Williamsburg," gentrifiers have now reached the more densely populated black and Hispanic sections of Bushwick proper. Its poor and middle-class residents, who 20 years ago might have been able to afford apartments just a stop or two from Manhattan in Williamsburg, are now being displaced to neighborhoods like Canarsie, East New York and Jamaica, where they struggle with long commutes. It won't be too long until they're pushed so far from job centers in Manhattan that they leave the city entirely, contributing to the growing sense that New York is too expensive for ordinary people. Rent regulation can keep some existing residents in their homes, and affordable housing programs can bring a small number of middle-income people into wealthy neighborhoods, but neither can change the fundamental laws of supply and demand. If desirable neighborhoods don't start shouldering more of the burden of increased urban demand, American cities will soon end up like their counterparts in Europe, where everyone except the rich and the tourists are shunted off to the suburbs.